Vol 161 #3830 5th August 1988 of the British Magazine, Model Engineer. 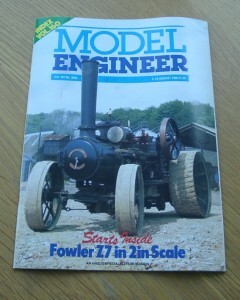 Features in this issue includes Renovating a Lathe – by workshop methods (part 1), Ivatt a 3 1/2 in. gauge L.M.S. class 2 tender locomotive (part 6), Superba a 2 in. scale model of the Fowler Z7S ploughing engine (part 1), Kaye gauge “1” L.B.S.C. Rly. 2-6-0 tender locomotive (part 2 ), Portway Drilling made easy, Steam explained (part 2) and The Shaw Top Railway.